Night clouds or noctilucent clouds are dull luminous mesospheric clouds in the upper atmosphere. They are visible in a deep twilight. They are made of crystals of water ice and most commonly are observed in the summer months at latitudes between 50° and 70° north and south of the equator. They can only be observed when the Sun is below the horizon. Mammatus clouds or mammatocumulus are a cellular pattern of pouches hanging underneath the base of a cloud. They are formed in sinking air contrary to any other form of clouds that are formed in rising air. There are various hypotheses offered behind the mechanism of its formation. A moonbow is a rainbow produced by moonlight rather than from direct sunlight. Moonbows are usually faint. Because of the faint light, it becomes difficult for the human eye to discern colors in a moonbow and as a result, they often appear to be white. However, all colors of a moonbow do appear in long exposure photographs. Volcanic lightning can be twice as powerful as lightning of supercell thunderstorms. Specialists believe it is caused by a silica-based charging process, in which volcanic ash is charged as magma fractures within the volcano. Hence fragmentation of magma during an explosive eruption causes the ash to gain a charge. It is like shuffling shoes on a carpet and the contact produces static charges, which is the basic principle behind ordinary thunderstorms too. Horsetail Fall is a seasonal waterfall that flows in winter and early spring in Yosemite National Park of California. It is otherwise known as “fire fall” because in a few days every year during the last two weeks of February as the sun sets behind the horizon line and everything begin to go dark, sunlight will hit and reflect off the falls at the exact right angle creating a spectacular albeit short-lived effect, which looks like a beautiful lava fall. Naga Fireballs are mysterious fireball bursts that emerge from Mekong River in Thailand. They are glowing pink orbs that hover over the murky waters for a split second before accelerating skyward about 100 meters and disappearing. Their numbers vary between tens and thousands per night. They are often reported around the night of Wan Ok Phansa (a local festival) in late October. Seafoam or beach foam is a type of foam created by the agitation of seawater that has higher concentrations of dissolved organic matter, particularly decaying algal blooms. Foam forms as this organic matter that is churned up by the surf. Most seafoam is not harmful to humans and is often an indication of a productive ocean ecosystem, but that is not the case when large harmful algal blooms decay near shore. 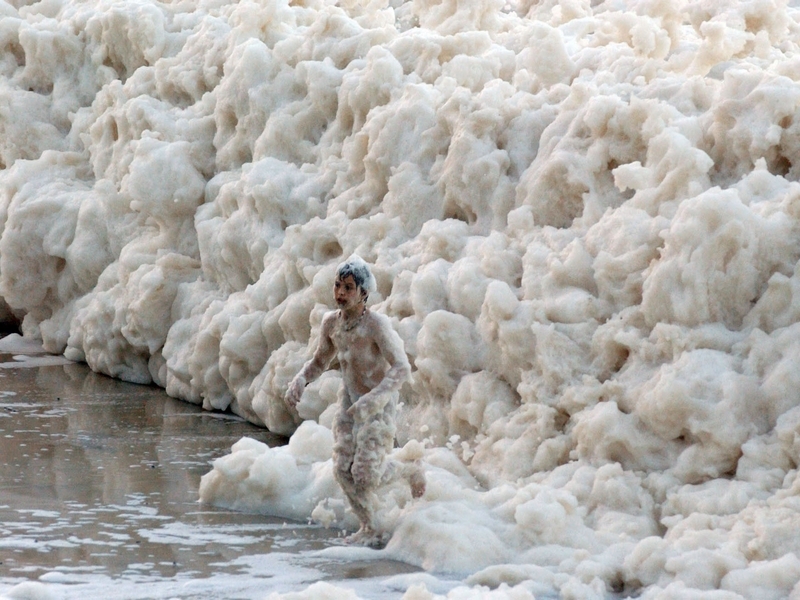 This kind of foam can potentially impact human health and the environment. A snow roller is a rare phenomenon in which large snowballs are formed naturally as chunks of snow are blown along the ground by wind, picking up material along the way. Unlike snowballs, snow rollers are typically cylindrical in shape and are often hollow since the inner layers, which are the first layers to form, are weak and thin compared to the outer layers. Ice circles occur in slow-moving waters in cold climates. They are thin and circular slabs of ice that rotate slowly in the water. They are most frequently observed in Scandinavia and North America. They are usually small, but they have been reported to be more than 4 meters in diameter. Brinicle or ice stalactite form beneath sea ice when a flow of extremely cold, saline water is introduced to an area of ocean water. The formation of a brinicle was first filmed in 2011 for the BBC series Frozen Planet. The sinking brine is so cold that it causes the seawater to freeze around it. When it hits the seabed, a web of ice spreads killing sea urchins and starfish.